The most populous city of the People’s Republic of China and indeed of the whole world, Shanghai is a culturally rich, trade and finance center and one of the most important cities in China. The total population of the Shanghai municipal region is in excess of 23 million. Shanghai is China’s most important city of commerce and influential in culture, finance, media, fashion, and technology. It is also the busiest container port in the world. It is located in the Yangtze River Delta in eastern China. Shanghai is strategically situated at the mouth of the Yangtze River in eastern China providing it great maritime trade potential. The village of Shanghai was a laid-back fishing hamlet till about the 11th century. The late 11th century reign of the Song Dynasty of China lent the city the boost required for it to bloom into the largest city of the world. Shanghai came into international limelight during the First Opium War in 1839 and with the Treaty of Nanking in 1842, the British slowly gained access to the Chinese mainland. The opening of foreign involvement helped grow the city’s stature and importance allowing for a steady influx of settlers. Shanghai became the port of contact for international trade and commerce. The city grew with the opening of various foreign colonies – American, British, and French – independent of native Chinese administrative control. The cityscape too grew varied and eclectic. Apart from Chinese immigrants, the city attracted a great number of Russian refugees in the 1920s. By 1932, Shanghai grew to become the fifth most populated city in the world. During the end 1930s more European refugees landed in this city adding to the burgeoning population. In 1949, with the establishment of the People’s Republic of China, the Shanghai Province and the port city came under the direct control of the Communist Party. Shanghai was closed off to foreign involvement and lost a lot of business as most of the international companies shifted base to nearby Hong Kong and Taipei. A special resolution passed in 1991, allowed Shanghai province to make its own set of economic laws and measures again opening it up to the world. Shanghai has been rapidly growing since then, and today it is considered the showcase for the booming Chinese economy, the country’s rich culture and colourful heritage. The Shanghai Bund, or waterfront, was first used in 1846. The Bund is surrounded by buildings which house the offices of the largest corporations in the world. 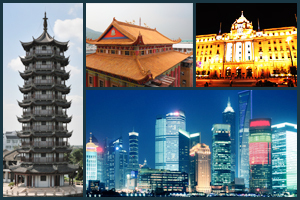 These buildings evince various architectural styles providing the Bund an eclectic ambiance. Most of the buildings here were constructed in the 1920s. The Bund is a center for international finance and trade, and at the same time is a great tourist attraction, especially after sunset. In the heart of the city, is the famous People’s Square of Shanghai. Spread over an area of 14 square kilometers, the People’s Square is surrounded by the Municipal Government office building, the Shanghai Museum, the Grand Theatre, and the Shanghai City Planning Exhibition Hall. The square is full of trees and the greenery offers breath-taking views of the Shanghai skyline. At night, the views from a brightly lit People Square are simply spectacular. A visit to the most famous Buddhist temple, the Jade Buddha Temple is recommended. This temple was built in 1918 and reflects the architectural style of the Song Dynasty. More than 70 monks live in the temple and work to maintain its beauty. The outside temple wall is painted bright yellow. This temple houses a 2 meter high jade statue of Buddha carved out of a single piece of jade. There is also a meter long jade statue of Buddha in a reclining position. The Jade Buddha Temple is a fascinating place to visit For both Buddhist and non-Buddhist tourists alike. First opened to public in 1952, the Shanghai Museum is a grand building impresses the tourist with its rich art and artifact collection and due to the unique shows, symposiums, and exhibitions that are held here round the year. Reopened in a modern building in People’s Square (Huangpu Square) in 1996, the Shanghai Museum houses a collection of more than 120,000 Chinese cultural relics ranging from the Stone Age to the modern times. These artifacts include jade, bronze, and copper idols, Chinese pottery, stone carvings, ancient coins, silk embroidery, dyed fabric, ivory carvings, and other traditional Chinese artworks. The sprawling museum is visited by millions of tourists from all over the world each year. A visit to Shanghai must include a trip to the famous Yuyuan Gardens of Shanghai. Located right at the heart of the old Shanghai, the garden is after the Chinese words for peace and health. And indeed it is peace and good health that the Yuyuan Gardens offer. This garden is about 400 years old, and yet is well kept. The sprawling greenery, old trees, and oriental manicured gardens are great attractions. The peace and tranquillity of the gardens belies the bustle of the populous city outside. The main shopping zones in Shanghai are on Nanjing Road and Huaihai Road. Some of the biggest brands and the famous designer stores have flagship stores in Shanghai. The outdoor bazaar at Yuyuan Gardens offers a unique shopping experience with a selection of souvenirs and handicrafts on sale. The Cultural Street Market on Fuzhou Road, the Antique Street Market on Dongtai Road, and the street market on Shimen Road are a few of the traditional open-air Chinese markets in town. In Shanghai, shoppers mostly shop for traditional Chinese silk. The best place to buy Chinese silk is Jiangnan Silk Museum on Aomen Road, Putuo District, and the Shanghai Silk Mansion Company Ltd. stores spread across the city. The Super Brand Mall is rated the top mall in Shanghai. Located in Pudong’s Lujiazui Area, it is 13 stories tall and houses over 150 shops. There are over 70 restaurants and cafes in Super Brand Mall. Grand Gateway Shopping Arcade in the Xujiahui area, Citic Square Mall in Nanjing, Times Square on Huaihai Middle Road, Plaza 66 Shopping Mall in the Puxi area of Shanghai, and Shanghai Hong Qiao Friendship Shopping Center, located at Hong Qiao Development Zone are among the top shopping malls of Shanghai. Shanghai is an economically prosperous and vibrant city. The nightlife of this city is happening heady mix of music, dance, and entertainment. Cabaret by Tian Di is a popular hangout, famous for its Moulin Rouge-style live performances. Aquarium Bar, Bar Rouge, L18, Paramount Partyroom, Sin Lounge , Babyface Room, and 3D Art Bar are among the most visited night spots of Shanghai.